The Atlanta downtown area is not really my idea of runner-friendly. It's fairly urban and bordered by a wide freeway along the long north/south length of the city center. But, luckily, there are quieter, greener areas just to the east and west where you can run in peace and quiet. In the last decades, the Midtown area of Atlanta -- north of the traditional downtown, centered around 14th Street NW -- has turned into a new high-rise center of trade, and you might well find yourself there if on a business trip. We'll take that as our starting point for a pleasant run through residential areas and then Piedmont Park, west of Midtown. The heart of Midtown lies at 14th Street NW and Peachtree Street NE (NOT Peachtree Street NW located a few blocks west of here!). Peachtree NE is the main north/south street in the downtown area, and it still has a few relicts of Old Atlanta that haven't been ripped down yet and replaced with shiny, sterile high-rises. 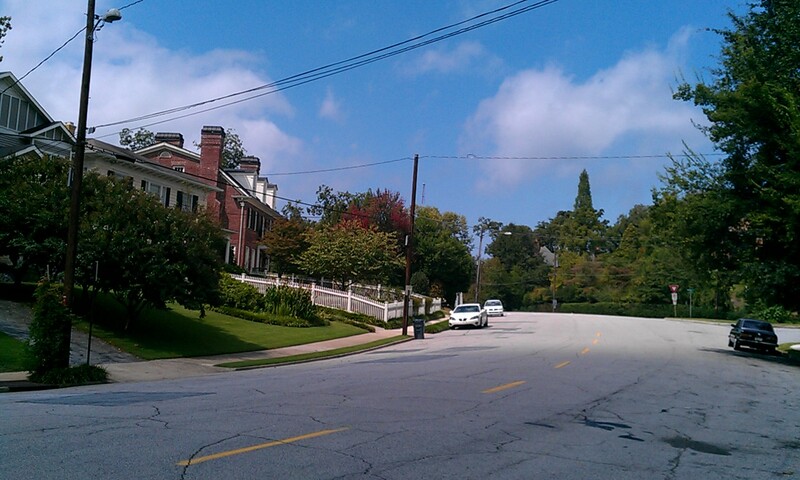 For example, just a hundred meters south of the intersection you'll find the gracious old mansion housing the Atlanta Women's Club. But somehow the elegant clubhouse looks a bit tentative in the looming shadows of the surrounding sky-scrapers. But no time for mourning here, we're out for a good run. So let's head north on Peachtree NE for just 1 block and then turn right on 15th Street NE, into the Ansley Park neighborhood. Suddenly, you're immersed into a whole different world, full of leafy trees and pleasant homes on hillsides, and little neighborhood parks. You'll probably already feel yourself breath a sigh of relief. It doesn't really matter which streets we loop around here: the idea is to put on a few miles in this beautiful neighborhood. And the small hills add extra value to your run. Let's curve around to the left on Peachtree Circle, then turn off at the second right on Westminster Drive. I love this street, with the houses rising up the hillside on the left, and Winn Park sloping down into the dale on the right. 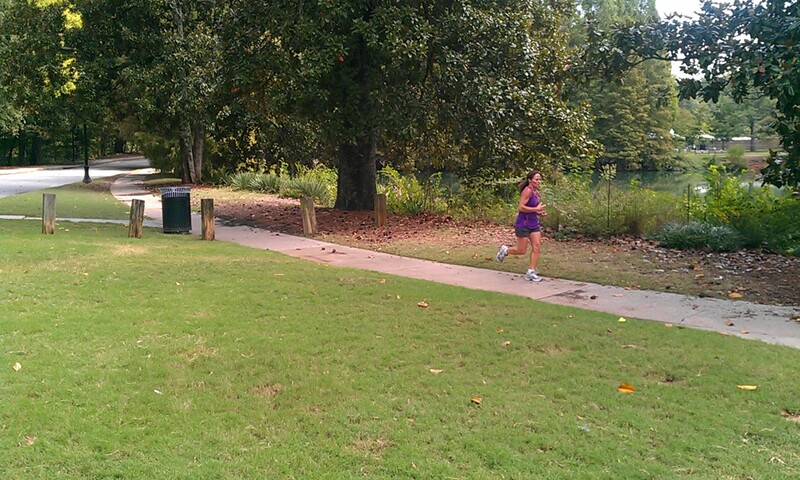 At the first chance, run down into the park and loop through it, but keeping up the same general direction. Winn Park ends where Westminster runs into The Prado. But there are 2 little parks across the street that follow the valley, like a chain of pearls. So cross The Prado into tiny Eubanks Park, then cross Barksdale Drive into Ansley Park. You come up out of Ansley Park at Maddox Drive. We'll turn right on Maddox and run a few steps to Park Drive, then turn right again and follow it south through the neighborhood until we exit at Piedmont Avenue. 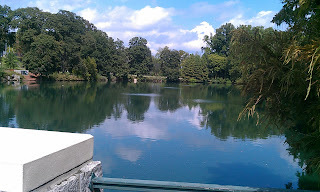 So now we'll start the second phase of the run, running through Piedmont Park (a real park, not the name of a neighborhood). 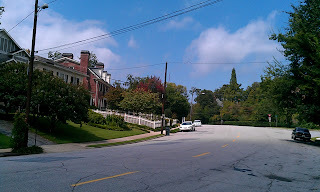 Cross Piedmont Ave. here and run straight ahead. You are on a hill, with the valley coming up in front of you. The botanical garden is on your right, and the Storza Woods is on your left. I always like to take a loop through the woods and back. There is a trail there, as the only cost-free part of the botanical garden. But you'll have to decide if you like running in a lonely spot like that. I enjoy it, though. The road curves to the right, past the entrance to the botanical gardens, and stright into Piedmont Park itself. The park was home to the 1895 World's Fair, and was later redeveloped by the guy who planned New York's Central Park. But obviously, a bit less effort was put into Piedmont. It's mainly a rolling lawn with occasional trees, baseball fields and a large pond. 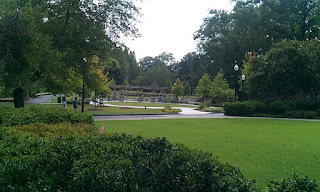 NOTE: on a return trip in September 2011, the park had undergone a beautiful restoration, and was looking great. Let's turn left at the main lawn and we'll lap the pond, Lake Clara Meer. Turn left when the path comes to the lake, and just follow it all the way around, and when you almost get back to your starting point, cross the bridge over the middle of the lake to take you further south to loop through the rest of the park. Run through the open lawns a the south end of the park until the park ends at 10th Street. Then follow the path back west along the road, heading back up towards Midtown. Just go straight on 10th Street (I actually like exploring the quiet, hilly neighborhood just south of here, and run up 8th Street). You'll go by the Flying Biscuit Cafe, with the best breakfast food in existance. After a few blocks you'll run back into Peachtree Stree NE, where you turn right and run north the few blocks back to the starting place. 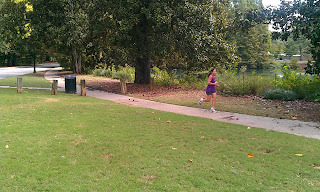 I live in metro Atlanta and agree this is a nice run if you find yourself on business in Midtown. Or if you're near Midtown, you could even take MARTA to Arts Center Station, which lets you off at the city symphony, theatre and museum complex directly across Peachtree Street from the Ansley Park neighborhood ... or take a taxi to Piedmont Park. It's worth it if you don't have good running near your hotel or conference center. Thanks for the transportation tips! 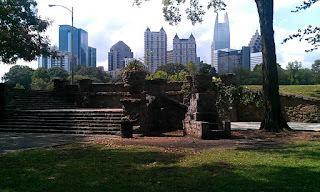 The stone steps, two photos up, is significant in that The Allman Brothers Band played there twice: in 1969 and again in '70, in their early days. The Hampton Grease Band and others used to play there as well back in the day. I didn't realize the Allman Brothers had done concerts there. They were one great band. Thanks Uncle Aaron!